Homemade Brobee Cake – Happy. Homeschooling. Housewife. That’s right, you read it correctly, I made a Brobee cake and if I can do it–anyone can! This weekend was a busy weekend…our precious Princess Jubilee turned 2 and everyone was excited to celebrate her. Weeks leading up to her birthday her sisters held meetings to plan the big day. Oh their ideas were surely creative as they wanted to make sure she would have a special day. The one thing they thought she would love was her very own Brobee cake. 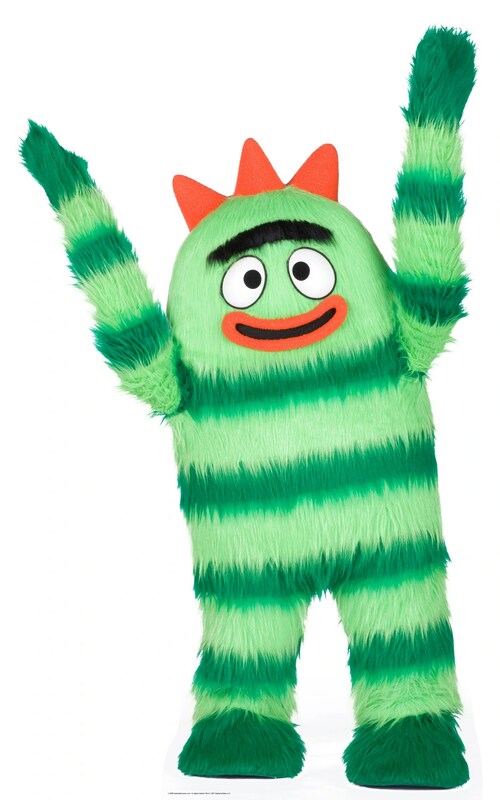 Now, for those of you who do not know who Brobee is, he is the four year old (he just had a birthday as well) emotional (yes, he is very moody) green monster on Yo Gabba! Gabba, Princess Jubilee’s favorite tv show. She absolutely adores this little guy and she has for quite some time now. Khari and I are both fascinated (and a little concerned) that she has such affections for him. Everyday she asks for her Brobee and she lights up when she sees him dancing and singing on the screen. Brobee is also the one thing (well, that and countless rounds of “Twinkle, Twinkle Little Star”) that can actually calm her down. So when Princess Bella suggested a Brobee cake I knew that would put a huge smile on her sister’s two year old face! But I was left with a problem…how would I actually make Brobee. I have baked cakes before, you know the simple kind–cake on the bottom and icing on the top. But to create a dramatic cake like this, well I was in uncharted territory but was willing to give it a try. And I am so glad I did. After hours working on the guy I stepped back and was pretty proud of myself. I actually created Brobee…well maybe not the Brobee, but a close 3rd. And when Princess Jubilee saw Brobee right there in her kitchen her face lit up. She was so amazed and had such a great time eating him. Oh and by the way, not only was it a cute cake (in a Brobee kind of way) but it actually tasted great! I used my favorite chocolate cake recipe and buttercream frosting. Everyone enjoyed Brobee–the young and the old. Now when I look at Brobee I smile inside as we have bonded! Ready to make you own Brobee cake? Chocolate cake — you will need one square pan and one rectangle pan. Bake your cakes. You can use a boxed cake mix, but if you are looking for an easy chocolate cake recipe then look no more. After the cakes cool flip them onto the serving platter and gently trim the top of the cake to level it off. The cake is pretty big so I used part of a box and covered it with aluminum foil. Now you are ready to shape the body. I used the rectangle shape to form the body. To do this I just cut a triangle at the bottom to make the legs. Use the square cake to make the arms. I used a glass to help form a rounded edge at the top of the arm sockets. Using the light green icing, do a crumb coating over the entire body of Brobee. A crumb frosting is really what it says it is. It is a light covering that does have crumbs in it. After the cake sets, add a second coating of icing. This coating should cover the entire cake and should be smooth without the crumbs. Take your dark green and put it in a frosting bag with a grass tip. Following the lines fill it in with the darker greener icing. This will make him fluffy. Now you are ready to decorate the body. I used red twizzlers for the mouth and filled the inside of the mouth with crushed oreo cookies (the outside cookie part, the white filling I ate!). I cut large marshmallows in half for the eyes and attached a candy eye to it. I also used the oreo crumble for Brobee’s unibrow. She was so excited about her Brobee cake! Yes, the cake was such a hit. That night she went to bed and thank God for her “Brobee cake”, that made all the work worth it.